After Focus and Full Throttle, its easy to see that some people just don't know when to stop! The "Aftermath" will be the start for some and the final straw for others. The 1st, award winning author and wrestling upstart, Lynzee Pike will have her 1st singles match against the woman who Syde Effect hand picked to destroy her. Dani Fererra is coming to end this chapter and write her own book of sorrows for Ms. Pike. RWC hasn't seen a ladies match of this calibre in awhile! 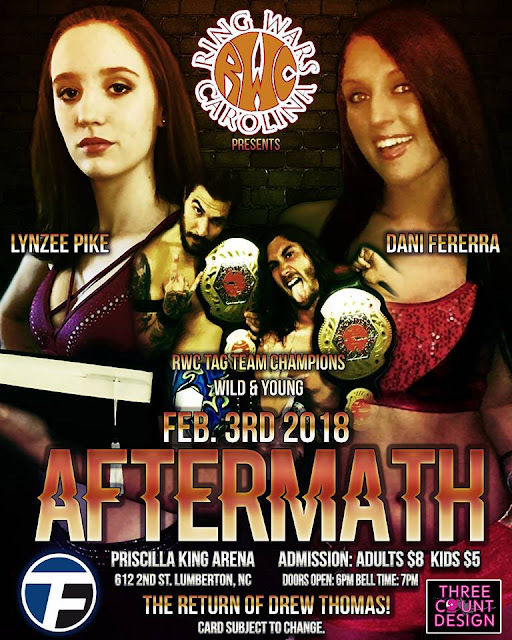 The Ring Wars Carolina Tag Team Champions, Wild & Young will be defending the newly won titles February 3, 2018. Who is up for the challenge? We will find out real soon! "The Undefeated One" Drew Thomas returns to RWC after a long time rehabbing a knee injury after getting jump in his home gym. The assailants were later identifies as being driven by James Anthony. Drew Thomas has set his cross hairs on beating the crap out of James Anthony! You will see this and a host of other RWC superstars, February 3, 2018 in the Priscilla King Arena located at 612 2nd street Lumberton NC!